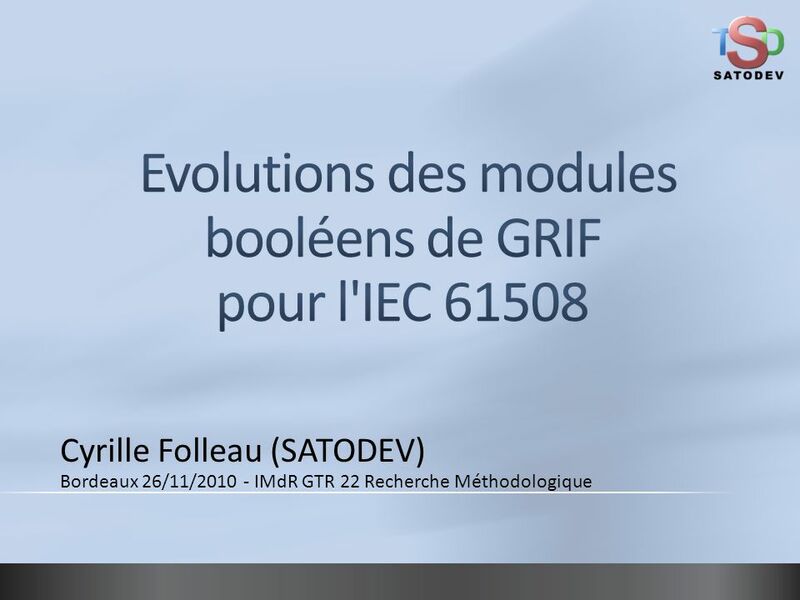 3/25/2017 3:30 AM Evolutions des modules booléens de GRIF pour l'IEC 61508 Cyrille Folleau (SATODEV) Bordeaux 26/11/ IMdR GTR 22 Recherche Méthodologique © 2007 Microsoft Corporation. All rights reserved. Microsoft, Windows, Windows Vista and other product names are or may be registered trademarks and/or trademarks in the U.S. and/or other countries. The information herein is for informational purposes only and represents the current view of Microsoft Corporation as of the date of this presentation. Because Microsoft must respond to changing market conditions, it should not be interpreted to be a commitment on the part of Microsoft, and Microsoft cannot guarantee the accuracy of any information provided after the date of this presentation. MICROSOFT MAKES NO WARRANTIES, EXPRESS, IMPLIED OR STATUTORY, AS TO THE INFORMATION IN THIS PRESENTATION. 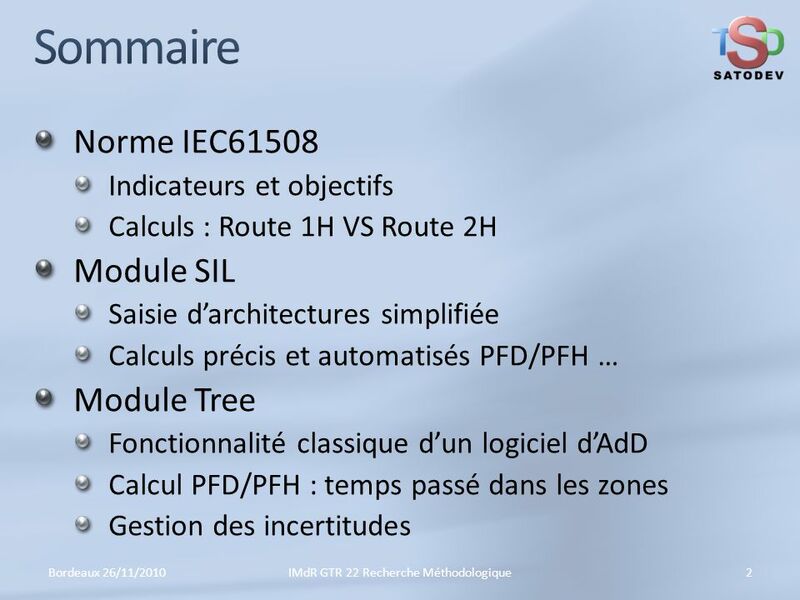 3/25/2017 3:30 AM Sommaire Norme IEC61508 Indicateurs et objectifs Calculs : Route 1H VS Route 2H Module SIL Saisie d’architectures simplifiée Calculs précis et automatisés PFD/PFH … Module Tree Fonctionnalité classique d’un logiciel d’AdD Calcul PFD/PFH : temps passé dans les zones Gestion des incertitudes Bordeaux 26/11/2010 IMdR GTR 22 Recherche Méthodologique © 2007 Microsoft Corporation. All rights reserved. Microsoft, Windows, Windows Vista and other product names are or may be registered trademarks and/or trademarks in the U.S. and/or other countries. The information herein is for informational purposes only and represents the current view of Microsoft Corporation as of the date of this presentation. Because Microsoft must respond to changing market conditions, it should not be interpreted to be a commitment on the part of Microsoft, and Microsoft cannot guarantee the accuracy of any information provided after the date of this presentation. MICROSOFT MAKES NO WARRANTIES, EXPRESS, IMPLIED OR STATUTORY, AS TO THE INFORMATION IN THIS PRESENTATION. 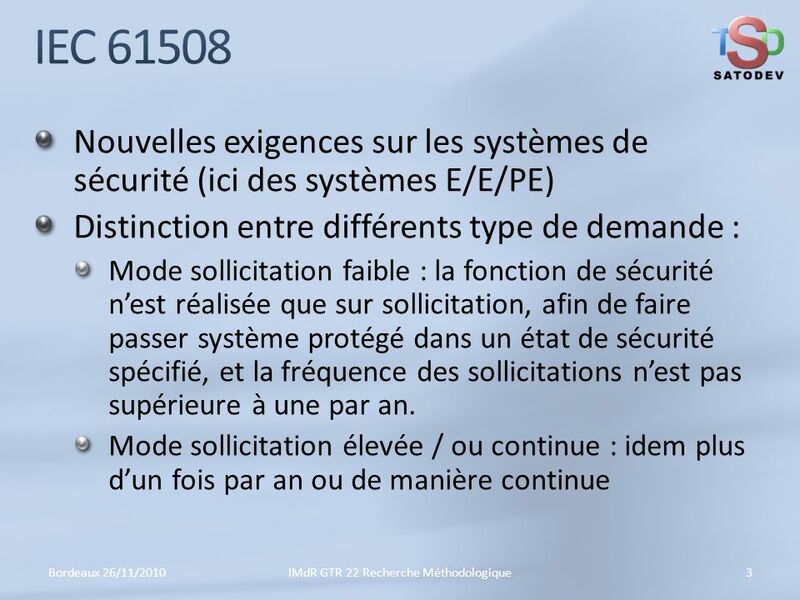 3/25/2017 3:30 AM IEC 61508 Nouvelles exigences sur les systèmes de sécurité (ici des systèmes E/E/PE) Distinction entre différents type de demande : Mode sollicitation faible : la fonction de sécurité n’est réalisée que sur sollicitation, afin de faire passer système protégé dans un état de sécurité spécifié, et la fréquence des sollicitations n’est pas supérieure à une par an. Mode sollicitation élevée / ou continue : idem plus d’un fois par an ou de manière continue Bordeaux 26/11/2010 IMdR GTR 22 Recherche Méthodologique © 2007 Microsoft Corporation. All rights reserved. Microsoft, Windows, Windows Vista and other product names are or may be registered trademarks and/or trademarks in the U.S. and/or other countries. The information herein is for informational purposes only and represents the current view of Microsoft Corporation as of the date of this presentation. Because Microsoft must respond to changing market conditions, it should not be interpreted to be a commitment on the part of Microsoft, and Microsoft cannot guarantee the accuracy of any information provided after the date of this presentation. MICROSOFT MAKES NO WARRANTIES, EXPRESS, IMPLIED OR STATUTORY, AS TO THE INFORMATION IN THIS PRESENTATION. 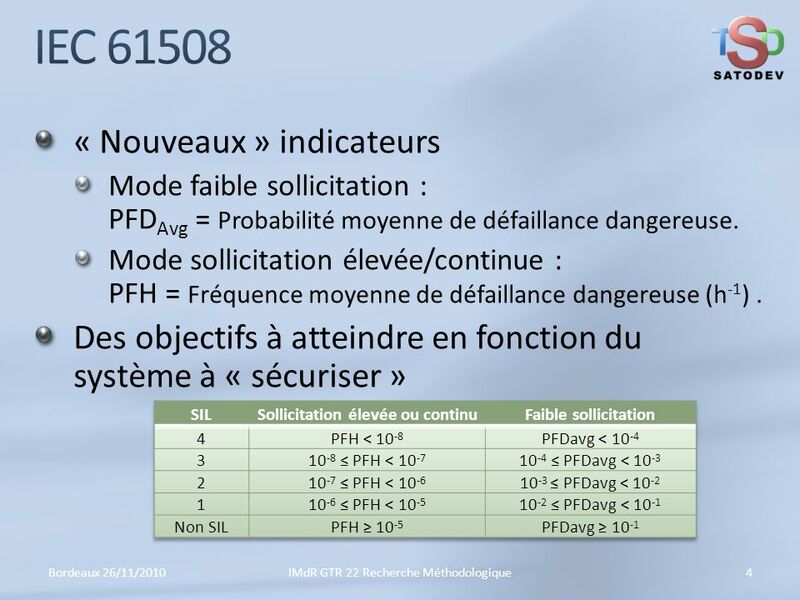 3/25/2017 3:30 AM IEC 61508 « Nouveaux » indicateurs Mode faible sollicitation : PFDAvg = Probabilité moyenne de défaillance dangereuse. Mode sollicitation élevée/continue : PFH = Fréquence moyenne de défaillance dangereuse (h-1) . Des objectifs à atteindre en fonction du système à « sécuriser » SIL Sollicitation élevée ou continu Faible sollicitation 4 PFH < 10-8 PFDavg < 10-4 3 10-8 ≤ PFH < 10-7 10-4 ≤ PFDavg < 10-3 2 10-7 ≤ PFH < 10-6 10-3 ≤ PFDavg < 10-2 1 10-6 ≤ PFH < 10-5 10-2 ≤ PFDavg < 10-1 Non SIL PFH ≥ 10-5 PFDavg ≥ 10-1 Bordeaux 26/11/2010 IMdR GTR 22 Recherche Méthodologique © 2007 Microsoft Corporation. All rights reserved. Microsoft, Windows, Windows Vista and other product names are or may be registered trademarks and/or trademarks in the U.S. and/or other countries. The information herein is for informational purposes only and represents the current view of Microsoft Corporation as of the date of this presentation. Because Microsoft must respond to changing market conditions, it should not be interpreted to be a commitment on the part of Microsoft, and Microsoft cannot guarantee the accuracy of any information provided after the date of this presentation. MICROSOFT MAKES NO WARRANTIES, EXPRESS, IMPLIED OR STATUTORY, AS TO THE INFORMATION IN THIS PRESENTATION. 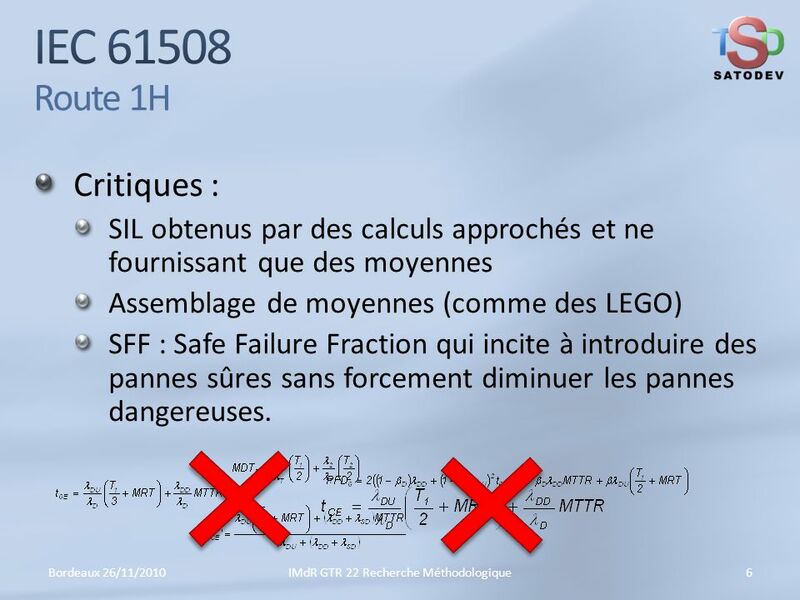 3/25/2017 3:30 AM IEC Route 1H Critiques : SIL obtenus par des calculs approchés et ne fournissant que des moyennes Assemblage de moyennes (comme des LEGO) SFF : Safe Failure Fraction qui incite à introduire des pannes sûres sans forcement diminuer les pannes dangereuses. Bordeaux 26/11/2010 IMdR GTR 22 Recherche Méthodologique © 2007 Microsoft Corporation. All rights reserved. Microsoft, Windows, Windows Vista and other product names are or may be registered trademarks and/or trademarks in the U.S. and/or other countries. The information herein is for informational purposes only and represents the current view of Microsoft Corporation as of the date of this presentation. Because Microsoft must respond to changing market conditions, it should not be interpreted to be a commitment on the part of Microsoft, and Microsoft cannot guarantee the accuracy of any information provided after the date of this presentation. MICROSOFT MAKES NO WARRANTIES, EXPRESS, IMPLIED OR STATUTORY, AS TO THE INFORMATION IN THIS PRESENTATION. 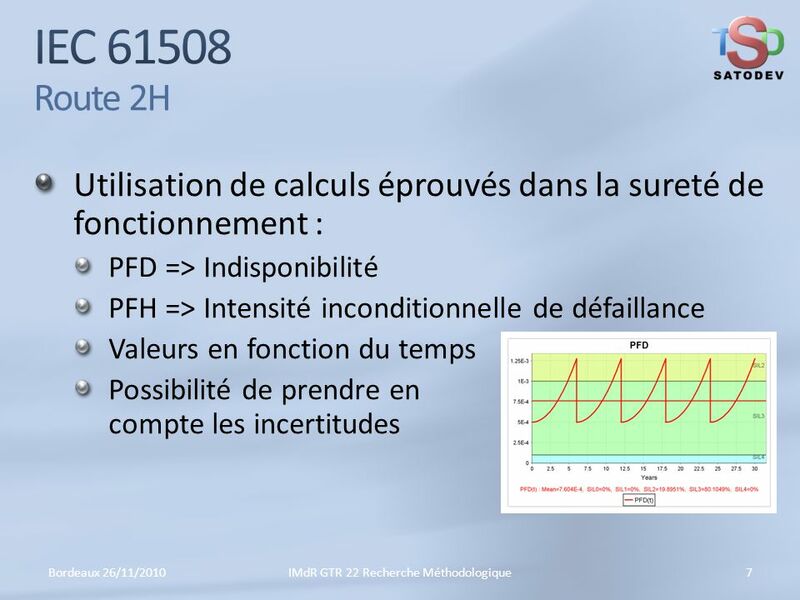 3/25/2017 3:30 AM IEC Route 2H Utilisation de calculs éprouvés dans la sureté de fonctionnement : PFD => Indisponibilité PFH => Intensité inconditionnelle de défaillance Valeurs en fonction du temps Possibilité de prendre en compte les incertitudes Bordeaux 26/11/2010 IMdR GTR 22 Recherche Méthodologique © 2007 Microsoft Corporation. All rights reserved. Microsoft, Windows, Windows Vista and other product names are or may be registered trademarks and/or trademarks in the U.S. and/or other countries. The information herein is for informational purposes only and represents the current view of Microsoft Corporation as of the date of this presentation. Because Microsoft must respond to changing market conditions, it should not be interpreted to be a commitment on the part of Microsoft, and Microsoft cannot guarantee the accuracy of any information provided after the date of this presentation. MICROSOFT MAKES NO WARRANTIES, EXPRESS, IMPLIED OR STATUTORY, AS TO THE INFORMATION IN THIS PRESENTATION. 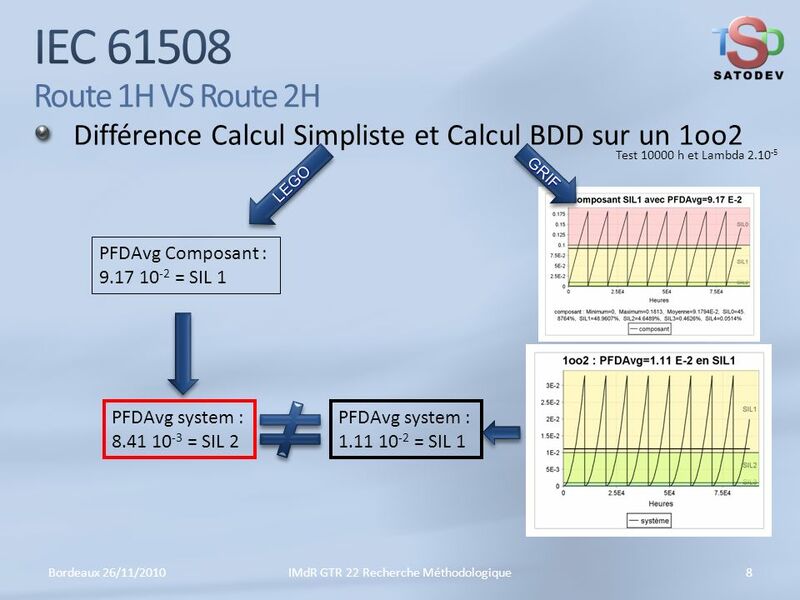 3/25/2017 3:30 AM IEC Route 1H VS Route 2H Différence Calcul Simpliste et Calcul BDD sur un 1oo2 Test h et Lambda GRIF LEGO PFDAvg Composant : = SIL 1 PFDAvg system : = SIL 2 PFDAvg system : = SIL 1 Bordeaux 26/11/2010 IMdR GTR 22 Recherche Méthodologique © 2007 Microsoft Corporation. All rights reserved. Microsoft, Windows, Windows Vista and other product names are or may be registered trademarks and/or trademarks in the U.S. and/or other countries. The information herein is for informational purposes only and represents the current view of Microsoft Corporation as of the date of this presentation. Because Microsoft must respond to changing market conditions, it should not be interpreted to be a commitment on the part of Microsoft, and Microsoft cannot guarantee the accuracy of any information provided after the date of this presentation. MICROSOFT MAKES NO WARRANTIES, EXPRESS, IMPLIED OR STATUTORY, AS TO THE INFORMATION IN THIS PRESENTATION. 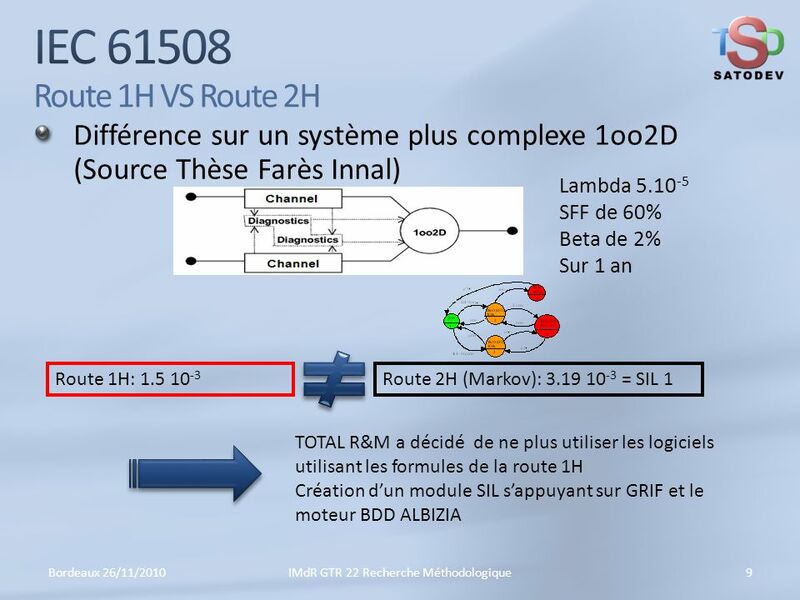 3/25/2017 3:30 AM IEC Route 1H VS Route 2H Différence sur un système plus complexe 1oo2D (Source Thèse Farès Innal) Lambda SFF de 60% Beta de 2% Sur 1 an Route 1H: Route 2H (Markov): = SIL 1 TOTAL R&M a décidé de ne plus utiliser les logiciels utilisant les formules de la route 1H Création d’un module SIL s’appuyant sur GRIF et le moteur BDD ALBIZIA Bordeaux 26/11/2010 IMdR GTR 22 Recherche Méthodologique © 2007 Microsoft Corporation. All rights reserved. Microsoft, Windows, Windows Vista and other product names are or may be registered trademarks and/or trademarks in the U.S. and/or other countries. The information herein is for informational purposes only and represents the current view of Microsoft Corporation as of the date of this presentation. Because Microsoft must respond to changing market conditions, it should not be interpreted to be a commitment on the part of Microsoft, and Microsoft cannot guarantee the accuracy of any information provided after the date of this presentation. MICROSOFT MAKES NO WARRANTIES, EXPRESS, IMPLIED OR STATUTORY, AS TO THE INFORMATION IN THIS PRESENTATION. 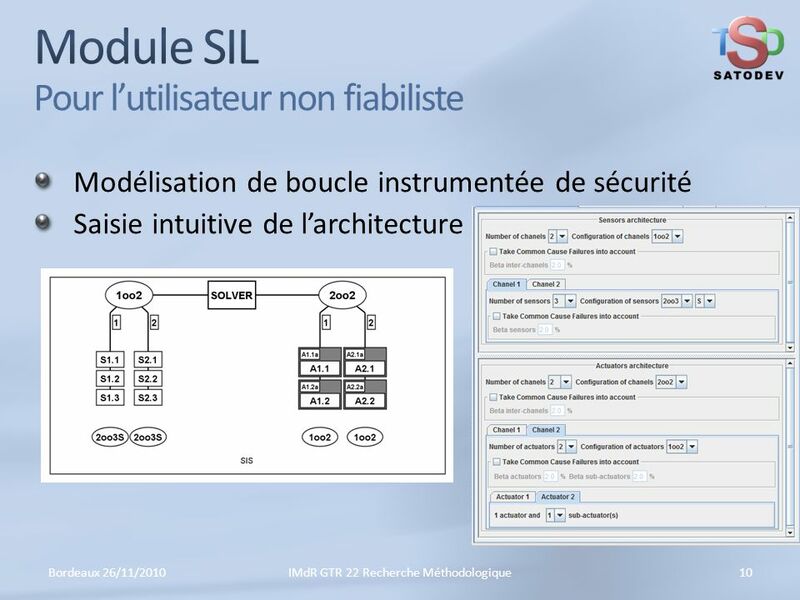 3/25/2017 3:30 AM Module SIL Pour l’utilisateur non fiabiliste Modélisation de boucle instrumentée de sécurité Saisie intuitive de l’architecture Bordeaux 26/11/2010 IMdR GTR 22 Recherche Méthodologique © 2007 Microsoft Corporation. All rights reserved. Microsoft, Windows, Windows Vista and other product names are or may be registered trademarks and/or trademarks in the U.S. and/or other countries. The information herein is for informational purposes only and represents the current view of Microsoft Corporation as of the date of this presentation. Because Microsoft must respond to changing market conditions, it should not be interpreted to be a commitment on the part of Microsoft, and Microsoft cannot guarantee the accuracy of any information provided after the date of this presentation. MICROSOFT MAKES NO WARRANTIES, EXPRESS, IMPLIED OR STATUTORY, AS TO THE INFORMATION IN THIS PRESENTATION. 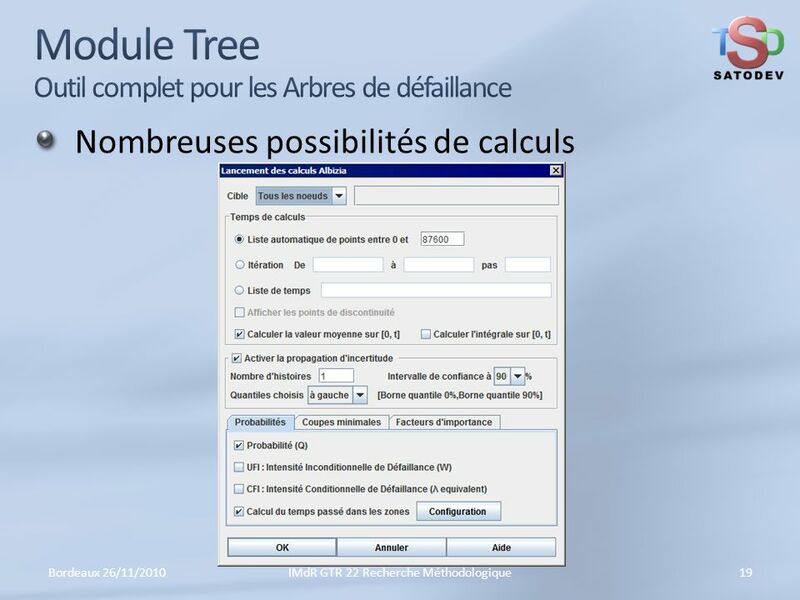 3/25/2017 3:30 AM Module SIL Gestion des différents mode de défaillance Nombreux paramètres pour éviter les approximations Pannes non détectées Pannes détectés Pannes dangereuses λdu λdd Pannes sûres λsu λsd Lois tests périodiques Lois GLM Bordeaux 26/11/2010 IMdR GTR 22 Recherche Méthodologique © 2007 Microsoft Corporation. All rights reserved. Microsoft, Windows, Windows Vista and other product names are or may be registered trademarks and/or trademarks in the U.S. and/or other countries. The information herein is for informational purposes only and represents the current view of Microsoft Corporation as of the date of this presentation. Because Microsoft must respond to changing market conditions, it should not be interpreted to be a commitment on the part of Microsoft, and Microsoft cannot guarantee the accuracy of any information provided after the date of this presentation. MICROSOFT MAKES NO WARRANTIES, EXPRESS, IMPLIED OR STATUTORY, AS TO THE INFORMATION IN THIS PRESENTATION. 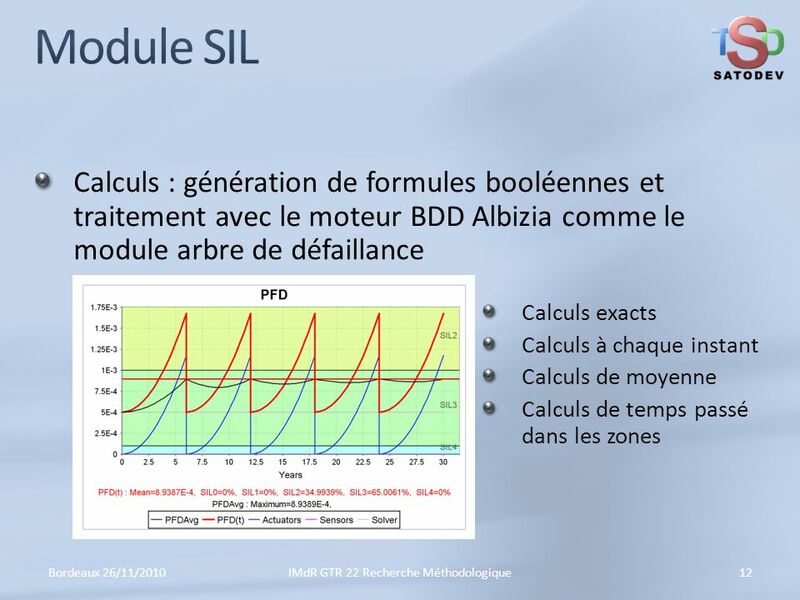 3/25/2017 3:30 AM Module SIL Calculs : génération de formules booléennes et traitement avec le moteur BDD Albizia comme le module arbre de défaillance Calculs exacts Calculs à chaque instant Calculs de moyenne Calculs de temps passé dans les zones Bordeaux 26/11/2010 IMdR GTR 22 Recherche Méthodologique © 2007 Microsoft Corporation. All rights reserved. Microsoft, Windows, Windows Vista and other product names are or may be registered trademarks and/or trademarks in the U.S. and/or other countries. The information herein is for informational purposes only and represents the current view of Microsoft Corporation as of the date of this presentation. Because Microsoft must respond to changing market conditions, it should not be interpreted to be a commitment on the part of Microsoft, and Microsoft cannot guarantee the accuracy of any information provided after the date of this presentation. MICROSOFT MAKES NO WARRANTIES, EXPRESS, IMPLIED OR STATUTORY, AS TO THE INFORMATION IN THIS PRESENTATION. 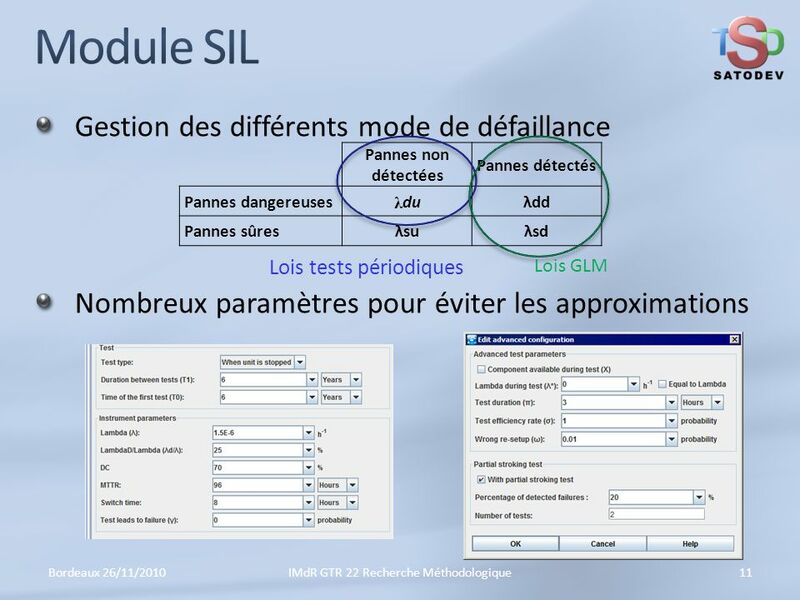 3/25/2017 3:30 AM Module SIL Possibilité d’introduire des décalages entre tests Bordeaux 26/11/2010 IMdR GTR 22 Recherche Méthodologique © 2007 Microsoft Corporation. All rights reserved. Microsoft, Windows, Windows Vista and other product names are or may be registered trademarks and/or trademarks in the U.S. and/or other countries. The information herein is for informational purposes only and represents the current view of Microsoft Corporation as of the date of this presentation. Because Microsoft must respond to changing market conditions, it should not be interpreted to be a commitment on the part of Microsoft, and Microsoft cannot guarantee the accuracy of any information provided after the date of this presentation. MICROSOFT MAKES NO WARRANTIES, EXPRESS, IMPLIED OR STATUTORY, AS TO THE INFORMATION IN THIS PRESENTATION. 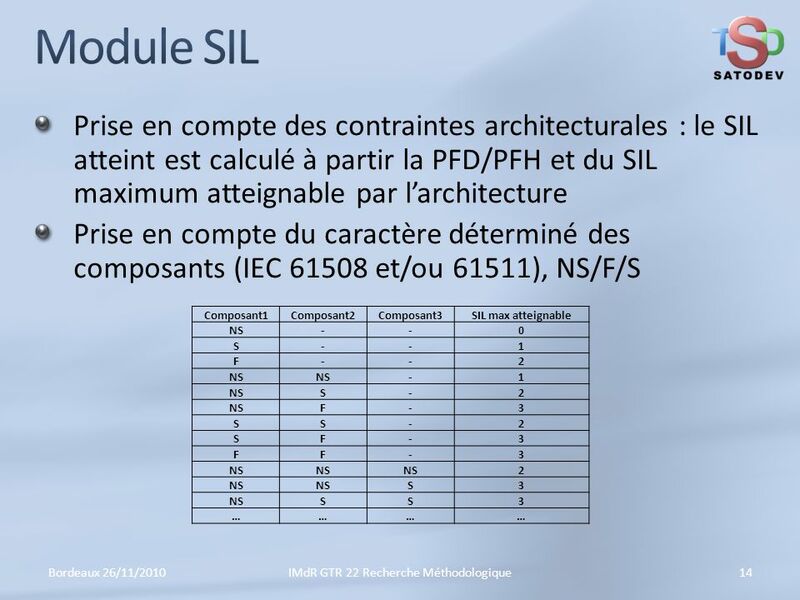 3/25/2017 3:30 AM Module SIL Prise en compte des contraintes architecturales : le SIL atteint est calculé à partir la PFD/PFH et du SIL maximum atteignable par l’architecture Prise en compte du caractère déterminé des composants (IEC et/ou 61511), NS/F/S Composant1 Composant2 Composant3 SIL max atteignable NS - S 1 F 2 3 … Bordeaux 26/11/2010 IMdR GTR 22 Recherche Méthodologique © 2007 Microsoft Corporation. All rights reserved. Microsoft, Windows, Windows Vista and other product names are or may be registered trademarks and/or trademarks in the U.S. and/or other countries. The information herein is for informational purposes only and represents the current view of Microsoft Corporation as of the date of this presentation. Because Microsoft must respond to changing market conditions, it should not be interpreted to be a commitment on the part of Microsoft, and Microsoft cannot guarantee the accuracy of any information provided after the date of this presentation. MICROSOFT MAKES NO WARRANTIES, EXPRESS, IMPLIED OR STATUTORY, AS TO THE INFORMATION IN THIS PRESENTATION. 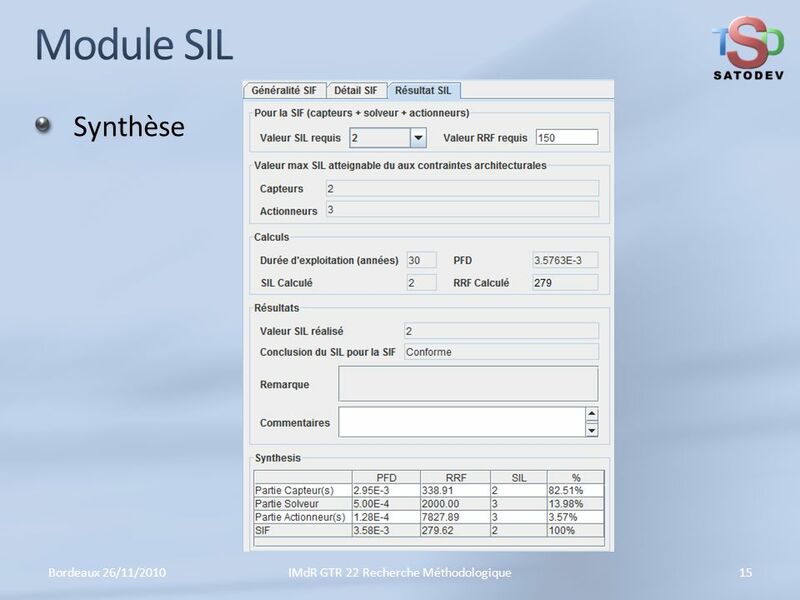 3/25/2017 3:30 AM Module SIL Synthèse Bordeaux 26/11/2010 IMdR GTR 22 Recherche Méthodologique © 2007 Microsoft Corporation. All rights reserved. Microsoft, Windows, Windows Vista and other product names are or may be registered trademarks and/or trademarks in the U.S. and/or other countries. The information herein is for informational purposes only and represents the current view of Microsoft Corporation as of the date of this presentation. Because Microsoft must respond to changing market conditions, it should not be interpreted to be a commitment on the part of Microsoft, and Microsoft cannot guarantee the accuracy of any information provided after the date of this presentation. MICROSOFT MAKES NO WARRANTIES, EXPRESS, IMPLIED OR STATUTORY, AS TO THE INFORMATION IN THIS PRESENTATION. 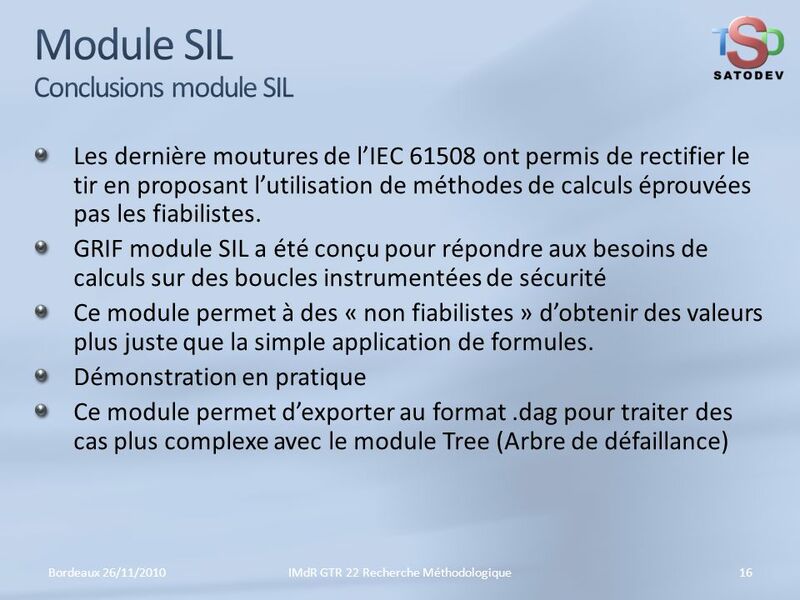 3/25/2017 3:30 AM Module SIL Conclusions module SIL Les dernière moutures de l’IEC ont permis de rectifier le tir en proposant l’utilisation de méthodes de calculs éprouvées pas les fiabilistes. 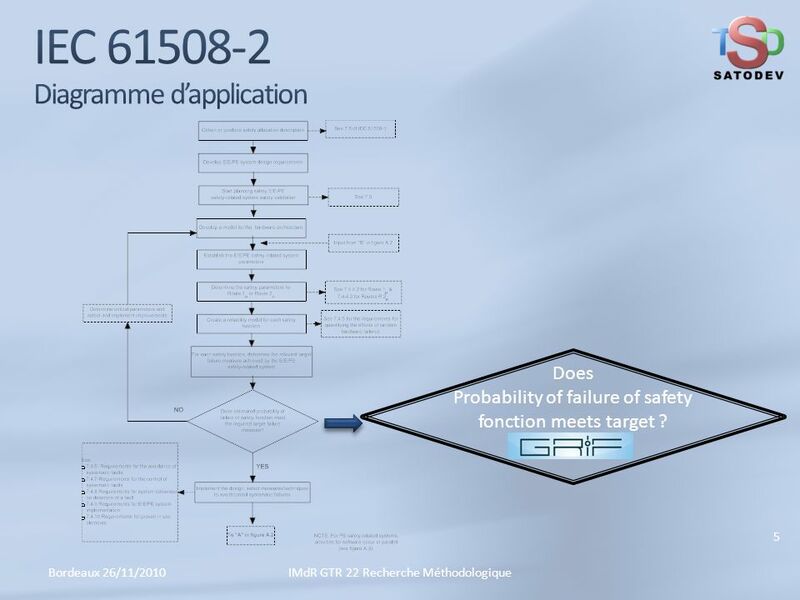 GRIF module SIL a été conçu pour répondre aux besoins de calculs sur des boucles instrumentées de sécurité Ce module permet à des « non fiabilistes » d’obtenir des valeurs plus juste que la simple application de formules. 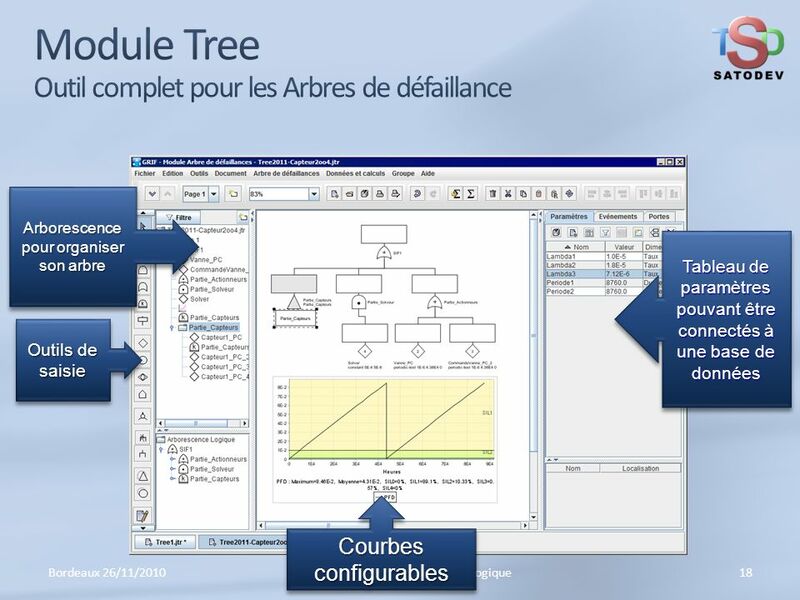 Démonstration en pratique Ce module permet d’exporter au format .dag pour traiter des cas plus complexe avec le module Tree (Arbre de défaillance) Bordeaux 26/11/2010 IMdR GTR 22 Recherche Méthodologique © 2007 Microsoft Corporation. All rights reserved. Microsoft, Windows, Windows Vista and other product names are or may be registered trademarks and/or trademarks in the U.S. and/or other countries. The information herein is for informational purposes only and represents the current view of Microsoft Corporation as of the date of this presentation. Because Microsoft must respond to changing market conditions, it should not be interpreted to be a commitment on the part of Microsoft, and Microsoft cannot guarantee the accuracy of any information provided after the date of this presentation. MICROSOFT MAKES NO WARRANTIES, EXPRESS, IMPLIED OR STATUTORY, AS TO THE INFORMATION IN THIS PRESENTATION. 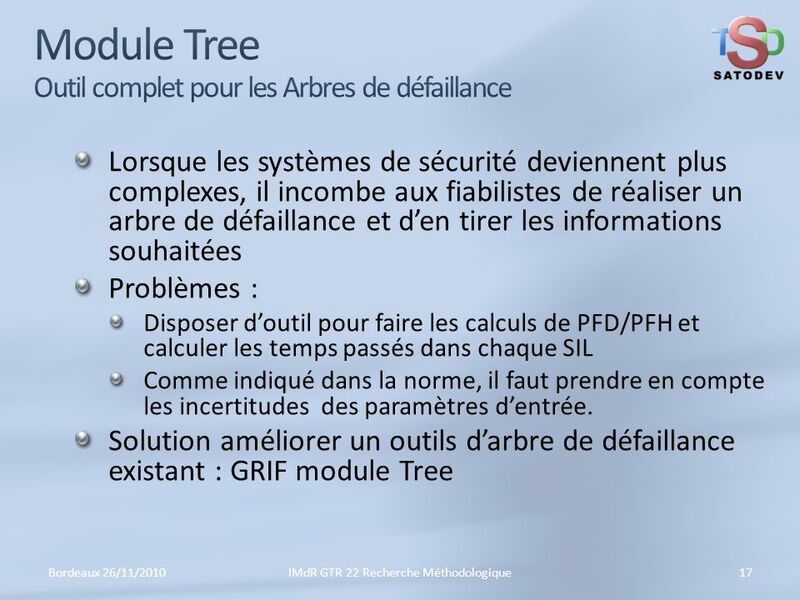 3/25/2017 3:30 AM Module Tree Outil complet pour les Arbres de défaillance Lorsque les systèmes de sécurité deviennent plus complexes, il incombe aux fiabilistes de réaliser un arbre de défaillance et d’en tirer les informations souhaitées Problèmes : Disposer d’outil pour faire les calculs de PFD/PFH et calculer les temps passés dans chaque SIL Comme indiqué dans la norme, il faut prendre en compte les incertitudes des paramètres d’entrée. 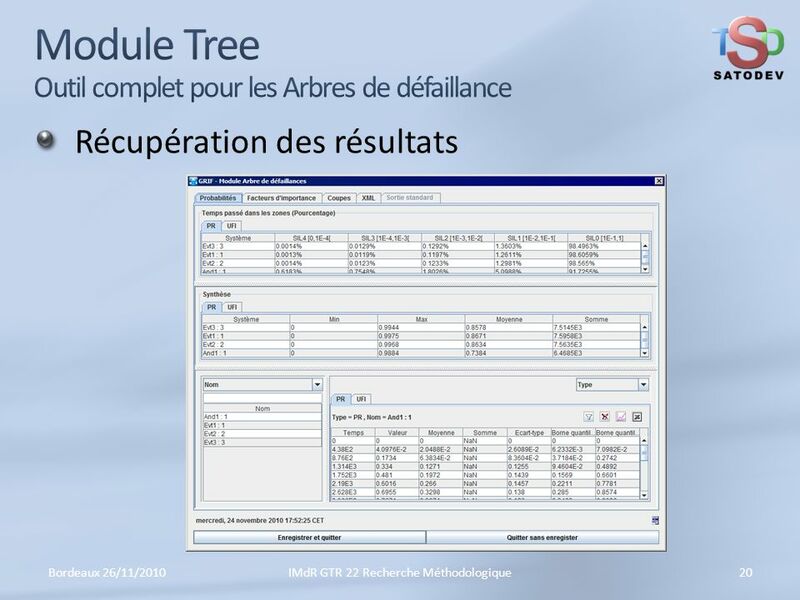 Solution améliorer un outils d’arbre de défaillance existant : GRIF module Tree Bordeaux 26/11/2010 IMdR GTR 22 Recherche Méthodologique © 2007 Microsoft Corporation. All rights reserved. Microsoft, Windows, Windows Vista and other product names are or may be registered trademarks and/or trademarks in the U.S. and/or other countries. The information herein is for informational purposes only and represents the current view of Microsoft Corporation as of the date of this presentation. Because Microsoft must respond to changing market conditions, it should not be interpreted to be a commitment on the part of Microsoft, and Microsoft cannot guarantee the accuracy of any information provided after the date of this presentation. MICROSOFT MAKES NO WARRANTIES, EXPRESS, IMPLIED OR STATUTORY, AS TO THE INFORMATION IN THIS PRESENTATION. 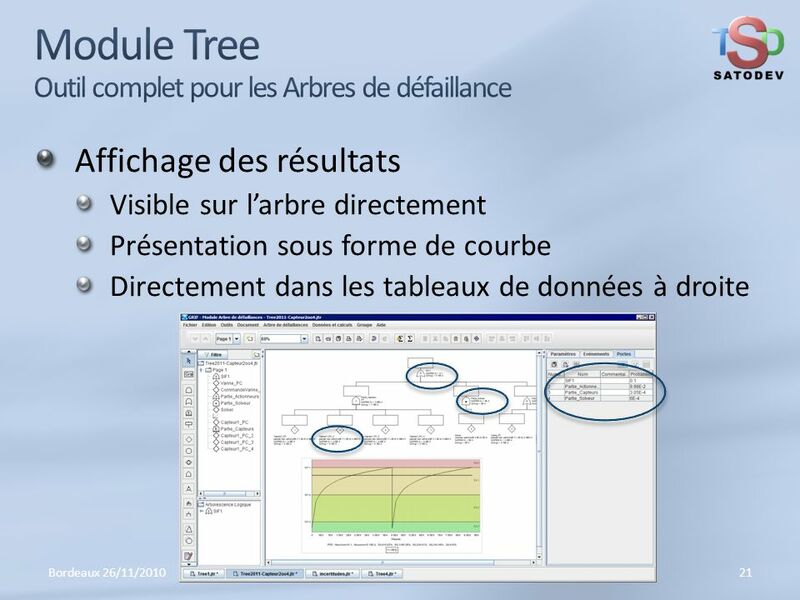 3/25/2017 3:30 AM Module Tree Outil complet pour les Arbres de défaillance Arborescence pour organiser son arbre Tableau de paramètres pouvant être connectés à une base de données Outils de saisie Courbes configurables Bordeaux 26/11/2010 IMdR GTR 22 Recherche Méthodologique © 2007 Microsoft Corporation. All rights reserved. Microsoft, Windows, Windows Vista and other product names are or may be registered trademarks and/or trademarks in the U.S. and/or other countries. The information herein is for informational purposes only and represents the current view of Microsoft Corporation as of the date of this presentation. Because Microsoft must respond to changing market conditions, it should not be interpreted to be a commitment on the part of Microsoft, and Microsoft cannot guarantee the accuracy of any information provided after the date of this presentation. MICROSOFT MAKES NO WARRANTIES, EXPRESS, IMPLIED OR STATUTORY, AS TO THE INFORMATION IN THIS PRESENTATION. 3/25/2017 3:30 AM Module Tree Outil complet pour les Arbres de défaillance Nombreuses possibilités de calculs Bordeaux 26/11/2010 IMdR GTR 22 Recherche Méthodologique © 2007 Microsoft Corporation. All rights reserved. Microsoft, Windows, Windows Vista and other product names are or may be registered trademarks and/or trademarks in the U.S. and/or other countries. The information herein is for informational purposes only and represents the current view of Microsoft Corporation as of the date of this presentation. Because Microsoft must respond to changing market conditions, it should not be interpreted to be a commitment on the part of Microsoft, and Microsoft cannot guarantee the accuracy of any information provided after the date of this presentation. MICROSOFT MAKES NO WARRANTIES, EXPRESS, IMPLIED OR STATUTORY, AS TO THE INFORMATION IN THIS PRESENTATION. 3/25/2017 3:30 AM Module Tree Outil complet pour les Arbres de défaillance Récupération des résultats Bordeaux 26/11/2010 IMdR GTR 22 Recherche Méthodologique © 2007 Microsoft Corporation. All rights reserved. Microsoft, Windows, Windows Vista and other product names are or may be registered trademarks and/or trademarks in the U.S. and/or other countries. The information herein is for informational purposes only and represents the current view of Microsoft Corporation as of the date of this presentation. Because Microsoft must respond to changing market conditions, it should not be interpreted to be a commitment on the part of Microsoft, and Microsoft cannot guarantee the accuracy of any information provided after the date of this presentation. MICROSOFT MAKES NO WARRANTIES, EXPRESS, IMPLIED OR STATUTORY, AS TO THE INFORMATION IN THIS PRESENTATION. 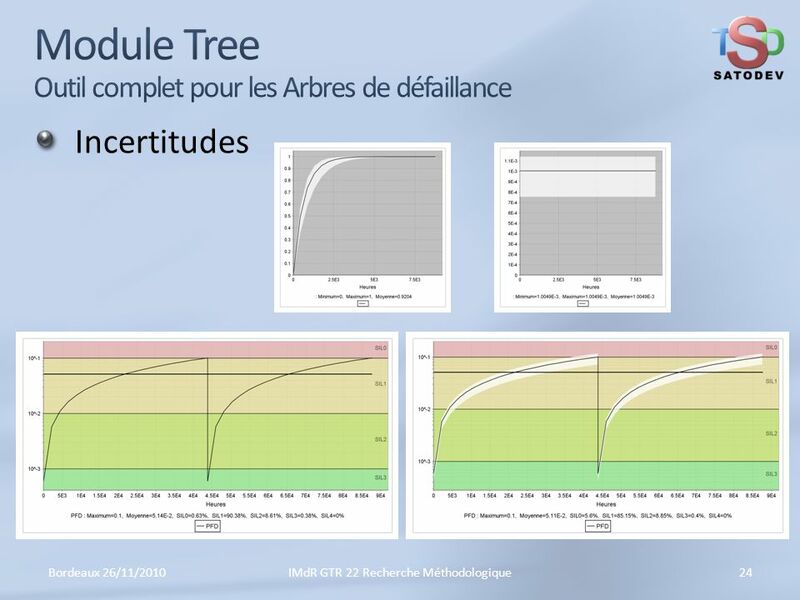 3/25/2017 3:30 AM Module Tree Outil complet pour les Arbres de défaillance Affichage des résultats Visible sur l’arbre directement Présentation sous forme de courbe Directement dans les tableaux de données à droite Bordeaux 26/11/2010 IMdR GTR 22 Recherche Méthodologique © 2007 Microsoft Corporation. All rights reserved. Microsoft, Windows, Windows Vista and other product names are or may be registered trademarks and/or trademarks in the U.S. and/or other countries. The information herein is for informational purposes only and represents the current view of Microsoft Corporation as of the date of this presentation. Because Microsoft must respond to changing market conditions, it should not be interpreted to be a commitment on the part of Microsoft, and Microsoft cannot guarantee the accuracy of any information provided after the date of this presentation. MICROSOFT MAKES NO WARRANTIES, EXPRESS, IMPLIED OR STATUTORY, AS TO THE INFORMATION IN THIS PRESENTATION. 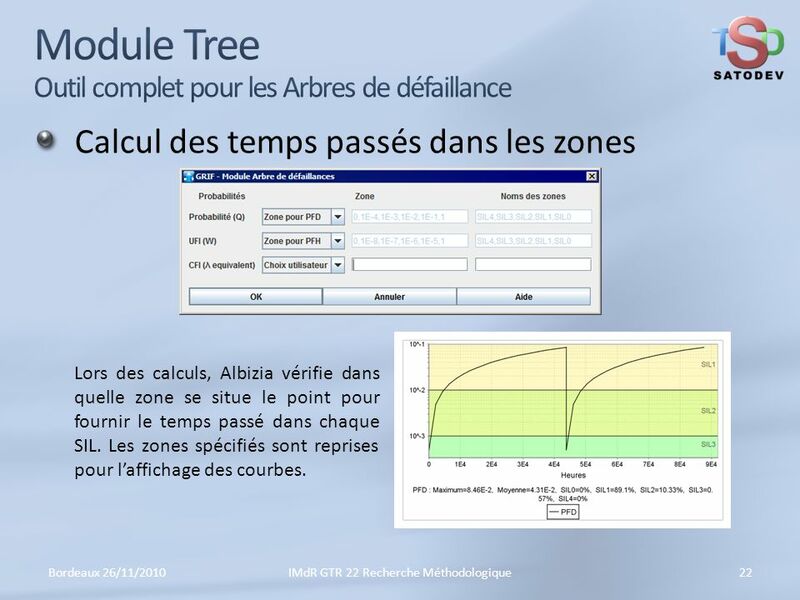 3/25/2017 3:30 AM Module Tree Outil complet pour les Arbres de défaillance Calcul des temps passés dans les zones Lors des calculs, Albizia vérifie dans quelle zone se situe le point pour fournir le temps passé dans chaque SIL. Les zones spécifiés sont reprises pour l’affichage des courbes. Bordeaux 26/11/2010 IMdR GTR 22 Recherche Méthodologique © 2007 Microsoft Corporation. All rights reserved. Microsoft, Windows, Windows Vista and other product names are or may be registered trademarks and/or trademarks in the U.S. and/or other countries. The information herein is for informational purposes only and represents the current view of Microsoft Corporation as of the date of this presentation. Because Microsoft must respond to changing market conditions, it should not be interpreted to be a commitment on the part of Microsoft, and Microsoft cannot guarantee the accuracy of any information provided after the date of this presentation. MICROSOFT MAKES NO WARRANTIES, EXPRESS, IMPLIED OR STATUTORY, AS TO THE INFORMATION IN THIS PRESENTATION. 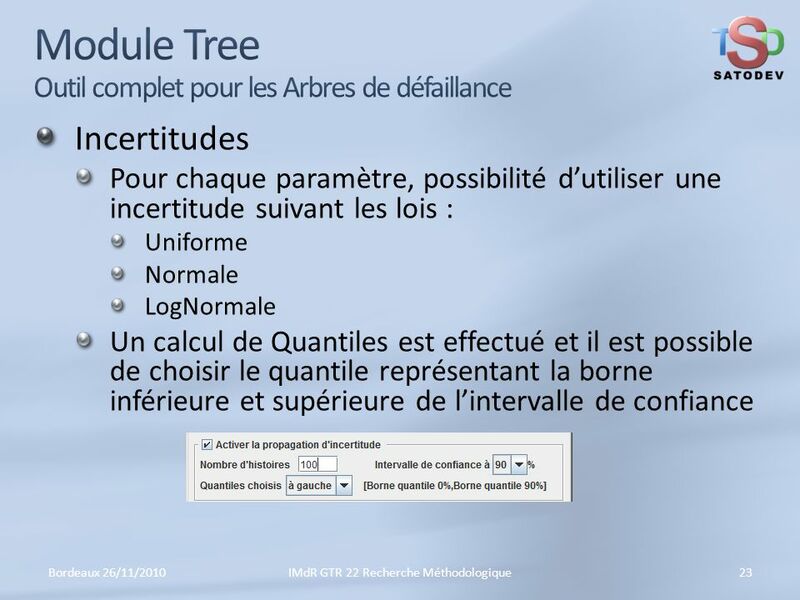 3/25/2017 3:30 AM Module Tree Outil complet pour les Arbres de défaillance Incertitudes Pour chaque paramètre, possibilité d’utiliser une incertitude suivant les lois : Uniforme Normale LogNormale Un calcul de Quantiles est effectué et il est possible de choisir le quantile représentant la borne inférieure et supérieure de l’intervalle de confiance Bordeaux 26/11/2010 IMdR GTR 22 Recherche Méthodologique © 2007 Microsoft Corporation. All rights reserved. Microsoft, Windows, Windows Vista and other product names are or may be registered trademarks and/or trademarks in the U.S. and/or other countries. The information herein is for informational purposes only and represents the current view of Microsoft Corporation as of the date of this presentation. Because Microsoft must respond to changing market conditions, it should not be interpreted to be a commitment on the part of Microsoft, and Microsoft cannot guarantee the accuracy of any information provided after the date of this presentation. MICROSOFT MAKES NO WARRANTIES, EXPRESS, IMPLIED OR STATUTORY, AS TO THE INFORMATION IN THIS PRESENTATION. 3/25/2017 3:30 AM Module Tree Outil complet pour les Arbres de défaillance Incertitudes Bordeaux 26/11/2010 IMdR GTR 22 Recherche Méthodologique © 2007 Microsoft Corporation. All rights reserved. Microsoft, Windows, Windows Vista and other product names are or may be registered trademarks and/or trademarks in the U.S. and/or other countries. The information herein is for informational purposes only and represents the current view of Microsoft Corporation as of the date of this presentation. Because Microsoft must respond to changing market conditions, it should not be interpreted to be a commitment on the part of Microsoft, and Microsoft cannot guarantee the accuracy of any information provided after the date of this presentation. MICROSOFT MAKES NO WARRANTIES, EXPRESS, IMPLIED OR STATUTORY, AS TO THE INFORMATION IN THIS PRESENTATION. 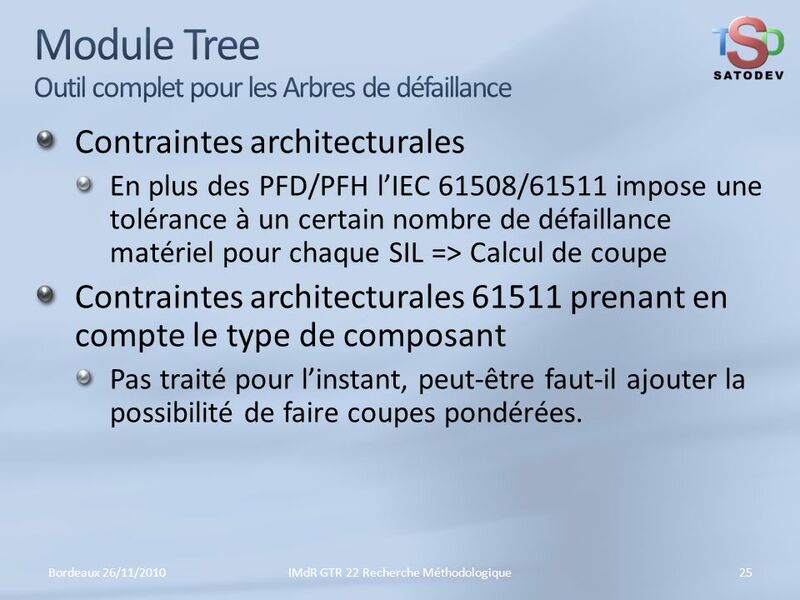 3/25/2017 3:30 AM Module Tree Outil complet pour les Arbres de défaillance Contraintes architecturales En plus des PFD/PFH l’IEC 61508/61511 impose une tolérance à un certain nombre de défaillance matériel pour chaque SIL => Calcul de coupe Contraintes architecturales prenant en compte le type de composant Pas traité pour l’instant, peut-être faut-il ajouter la possibilité de faire coupes pondérées. Bordeaux 26/11/2010 IMdR GTR 22 Recherche Méthodologique © 2007 Microsoft Corporation. All rights reserved. Microsoft, Windows, Windows Vista and other product names are or may be registered trademarks and/or trademarks in the U.S. and/or other countries. The information herein is for informational purposes only and represents the current view of Microsoft Corporation as of the date of this presentation. Because Microsoft must respond to changing market conditions, it should not be interpreted to be a commitment on the part of Microsoft, and Microsoft cannot guarantee the accuracy of any information provided after the date of this presentation. MICROSOFT MAKES NO WARRANTIES, EXPRESS, IMPLIED OR STATUTORY, AS TO THE INFORMATION IN THIS PRESENTATION. 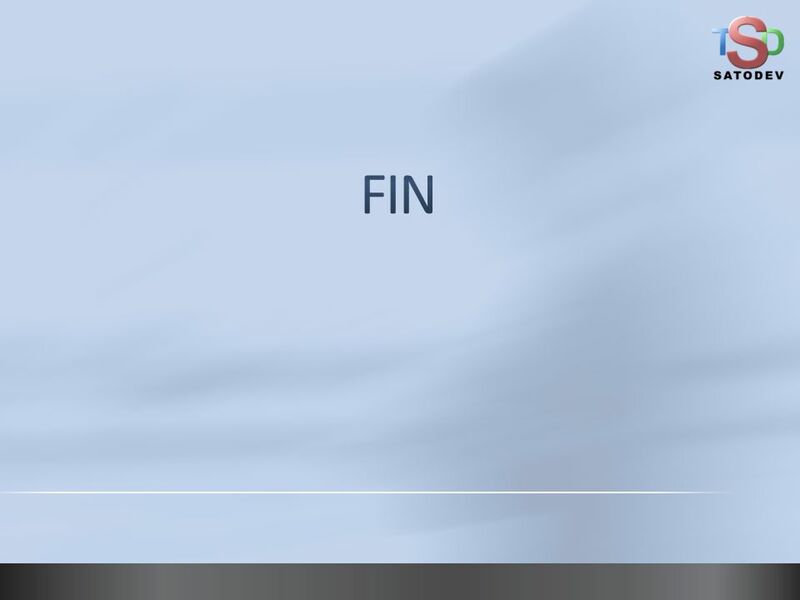 26 3/25/2017 3:30 AM FIN © 2007 Microsoft Corporation. All rights reserved. Microsoft, Windows, Windows Vista and other product names are or may be registered trademarks and/or trademarks in the U.S. and/or other countries. The information herein is for informational purposes only and represents the current view of Microsoft Corporation as of the date of this presentation. Because Microsoft must respond to changing market conditions, it should not be interpreted to be a commitment on the part of Microsoft, and Microsoft cannot guarantee the accuracy of any information provided after the date of this presentation. MICROSOFT MAKES NO WARRANTIES, EXPRESS, IMPLIED OR STATUTORY, AS TO THE INFORMATION IN THIS PRESENTATION. 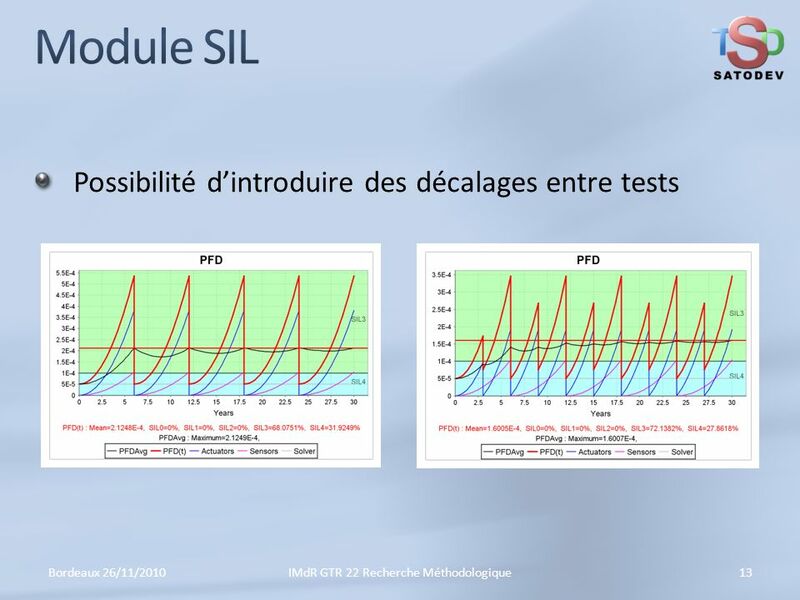 Télécharger ppt "Evolutions des modules booléens de GRIF pour l'IEC 61508"
2 sept. 2010GISEH Une méthode daide à la conception des systèmes de conduite de système productif de soins : AICOSCOPS Claude Pourcel – Olivier Bistorin. 21/11/2010lIntermédiation Financière Rurale pour la Croissance et la Création des Richesses1. ACCU 2010 Conférence annuelle des utilisateurs de Claroline 2010 Le site Claroline du Centre daide à la réussite (CAR) de lUQAR : Une « arrière-boutique.